The photo above was taken during our fieldwork at MNC for our Urban Anthro research paper. 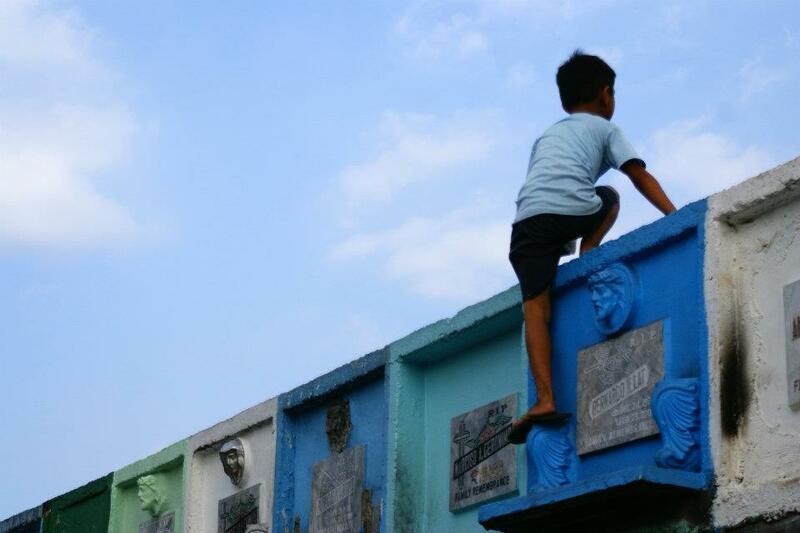 The shot features “Jun-jun”, the grandson of our main informant “Nanay Maria”, gazing on the busy A. Bonifacio avenue from the top of apartment-style niches on the walls of Manila North Cemetery. Jun-jun’s grandmother, Nanay Maria, started dwelling in the cemetery in the 70’s as a migrant from Leyte province hoping for a better life in the capital city. The cemetery is also where she met her husband, where they grew their kids and eventually, their grandchildren. Presently, only her son and his two kids remain to keep her company, as she continue to serve as the caretaker of dozens of tombs in MNC, including her husband’s and other departed relatives’ graves. Together with thousands of informal settlers living within the cemetery grounds, Nanay Maria and her family consider the concrete structures and spaces for the dead as their sanctuary amidst the chaotic and harsh environment of the city. Here, some settlers earn a living through selling candles, flowers, and snacks to the public visiting the graves of their departed loved ones, while others earn money by providing three-wheeled transportation within the 54 hectare public cemetery -the largest in the country. However, like Nanay Maria, most settlers here are primarily tomb caretakers. They offer their service to oversee and maintain the graves of their clients. All of these they do, not only to provide for their needs, but also to “legitimize” their existence and settlement within the space made for the dead, against the constant threat of eviction by the cemetery authorities which would consequently force them to succumb to the oppressive conditions of hunger and homelessness of the city. Through our observations and interviews with Nanay Maria, we saw the two faces of Manila North Cemetery for its settlers. On one hand, it serves as a sanctuary and a place of hope for its thousands of dwellers, as it provides them home and livelihood in the city full of ‘broken promises’. While on the other, it exposes the violent reality of the urban that buries the dreams of many migrants in the city: poverty, inequality, and homelessness. However, it is also worthy to note how these settlers continue to persist and struggle to live in front of the different uncertainties of their conditions, and how they assert and negotiate their existence in the place for the dead. In a place projected to be the site of opportunities, progress and development such as the city, we can see thousands of families struggling to meet the demands of the harsh life in the city through persisting to live in the margins, such as spaces made for the dead. And at the end of the day, one could ask him/herself: really, what kind of a system forces the living to work so that they can continue to live in a site made for the dead? Edit: This post is based on a research requirement for the course Urban Anthropology in UP Diliman. The research group members consist of Anthropology majors: Vince and Kariema, and Sociology majors Klarence, Jem and Camille.